Varvara Stepanova (1894-1958) was a defining figure in Constructivist art, whose extraordinary oeuvre includes theory, poetry, painting, graphic arts, typography, theater design and textile design. Stepanova began her art training at the Kazan School of Art in 1910. One of her classmates was Alexander Rodchenko who would become a lifelong work partner and her future husband. In 1913, she moved to Moscow and continued her training at the renowned Stroganov Academy. Through the 1910s, Stepanova would participate in the Russian futurist movement, producing highly experimental non-objective and zaum poetry. In these works she destroyed conventional language and constructed new meaning: as a great innovator, this is a strategy she would employ throughout her life. The years 1919 and 1920 were momentous for Stepanova. In 1919 she participated in the iconic 10th State Exhibition: Non Objective Creativity and Suprematism, and in 1920 joined the Institute of Higher Culture’s (INKhUK) discussions that were indispensable in shaping Constructivism’s trajectory. After Vsevolod Meyerhold — still considered the period’s most avant-garde theater director — saw her geometric works at the 5x5=25 exhibition, he immediately hired her to create costume and set design. Her stage contraptions for Death of Tarelkin (1922), and later Earth Rampant (1923) were some of the earliest examples of Constructivist design for the realm of theater. Among Stepanova’s most remarkable accomplishments of the 1920s however, was her work at the First State Textile Factory in Moscow. 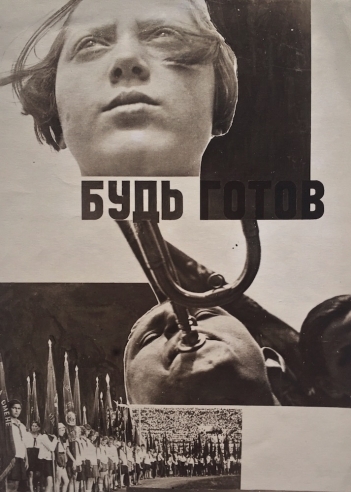 Many Constructivists dreamed of creating art that would be useful in Soviet everyday life. Stepanova and her colleague Liubov Popova succeeded when they mass-produced their textile designs. In addition to theory, graphic arts, theater design and textile design, Stepanova also contributed to the period’s key publications. In 1925 she made collages for the magazine Kino-Fot, and between 1923-1927, wrote for the magazine LEF, and designed layouts for USSR in Construction. She would also create a single-volume publication V. V. Mayakovsky, with maps of Mayakovsky’s trips through the Soviet Union. Stepanova continued to paint, design and innovate until her death in 1958.